I spent a few weeks in Tanzania during the summer of 2015. 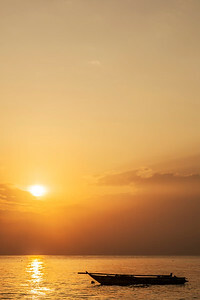 In addition to going on a safari, I also spent some time on the beautiful island of Zanzibar. Artificially-lit palm trees with a clear night sky in the background, taken on the Tanzanian island of Zanzibar, during the summer of 2015. Available in the following sizes (Rectangle B): 12x8, 18x12, 24x16, 30x20. 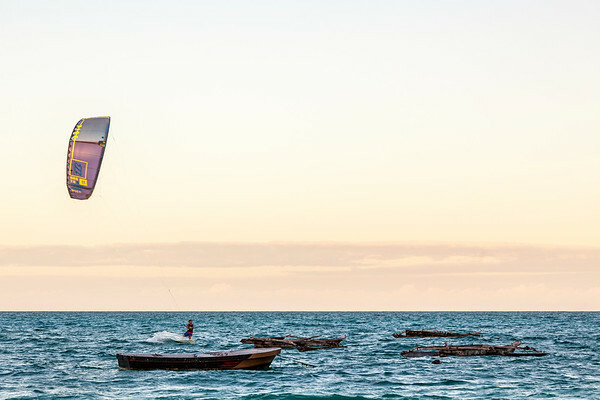 There's no shortage of fun things to do on Zanzibar. Case in point – this guy kite surfing. Available in the following sizes (Rectangle B): 12x8, 18x12, 24x16, 30x20, 36x24. 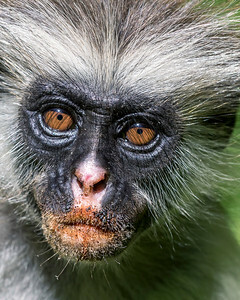 The Zanzibar red colobus is an endangered monkey native to the Tanzanian island of Zanzibar. They live in social groups of 30 to 50 individuals, and are fun to observe. 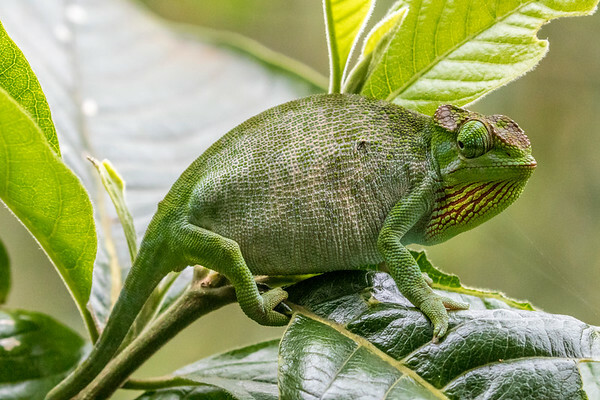 I spent a few hours watching the well-protected colony of the Ngezi Forest on one of my last days in Africa, in 2015. Available in the following sizes (Rectangle A): 10x8, 14x11, 20x16, 24x20, 30x24, 30x40. 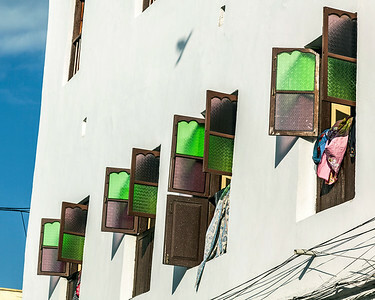 Stone Town's 19th Century architecture was inspired by Swahili culture, but also prominent are aspects of Arab, Persian, Indian, and European culture. The simple layout of this white building with purple and green windows caught my eye. Available in the following sizes (Rectangle A): 10x8, 14x11, 20x16, 24x20, 30x24, 40x30. The capitol of Zanzibar is Zanzibar City, and its historic center is Stone Town. Full of beautiful architecture dating back to the 19th century, the town was designated a UNESCO World Heritage Site in 2000. 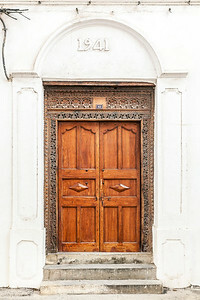 The doorway shown in this photo is similar to many of the doorways in this beautiful city. Available in the following sizes (Rectangle B): 8x12, 12x18, 16x24, 20x30, 24x36, 30x45. One of the dozens of sea turtles protected by northern Zanzibar's Mnarani Marine Turtle Conservation Pond. Available in the following sizes (Rectangle B): 12x8, 18x12, 24x16, 30x20, 36x24. 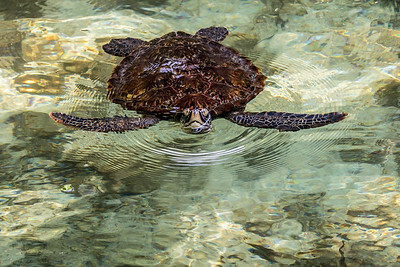 Many species of sea turtle are at serious risk of extinction. The Mnarani Marine Turtle Conservation Pond was established at the northern end of Zanzibar to try to protect these beautiful creatures to the greatest extent possible. The organization cleans beaches, rescues turtles, helps baby turtles reach the water, and educates fishermen in the area about safe fishing practices to avoid killing turtles. 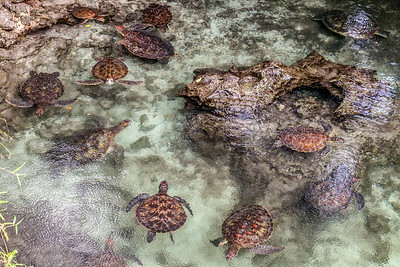 When I visited the Pond in July, 2015, there were dozens of sea turtles swimming through the beautiful, clear waters, and generally having a good time. Available in the following sizes (Rectangle B): 12x8, 18x12, 24x16, 30x20, 36x24. 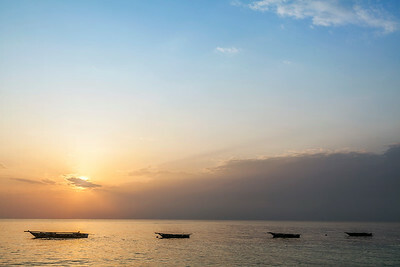 Four small boats off Zanzibar's northern coast. Available in the following sizes (Rectangle B): 12x8, 18x12, 24x16, 30x20, 36x24, 45x30. Many residents of the Tanzanian island of Zanzibar make their living from the sea. Consequently, you see boats of all different sizes and types all around the island. Small fishing boats like the one shown here, at sunset, are probably the most common. Available in the following sizes (Rectangle B): 8x12, 12x18, 16x24, 20x30, 24x36, 30x45. When I think of Africa, my mind immediately goes to lions, elephants, and other large animals, and I typically envision the landscape as endless plains. But there is a lot more to Africa than large animals and savannas. 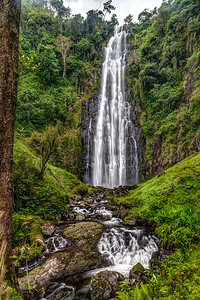 This photo was taken in the mountains of Tanzania, and is only one of many beautiful types of landscape in this enormous continent. Available in the following sizes (Rectangle B): 8x12, 12x18, 16x24, 20x30, 24x36, 30x45. I would have walked right past this master of disguise if my guide hadn't pointed him out to me. He remained perfectly still as I photographed him on my way to a waterfall. But on my hike back, he was long gone. Available in the following sizes (Rectangle B): 12x8, 18x12, 24x16, 30x20, 36x24. It's photos like this that allow one to appreciate both the similarities and differences of house cats and big, wild cats. Just like house cats, lions spend huge portions of their time napping in the sun. But they're a bit scarier. Available in the following sizes (Rectangle A): 8x10, 11x14, 16x20, 20x24, 24x30, 30x40. 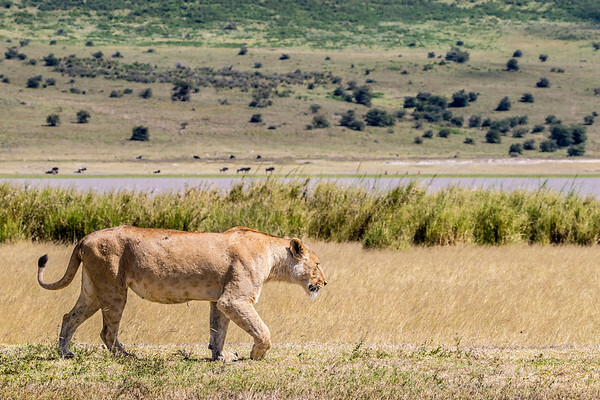 A lioness pacing across the savanna of Tanzania's Ngorongoro Crater. Available in the following sizes (Rectangle B): 12x8, 18x12, 24x16, 30x20, 36x24, 45x30. 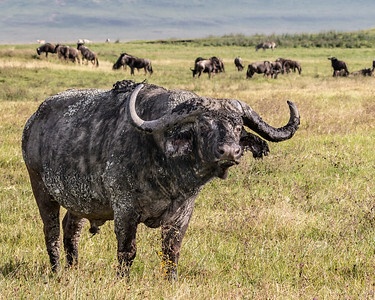 Although cape (or African) buffalo just kind of look like big, wild cows, they're arguably much more interesting creatures. Sometimes weighing over 2000 pounds, they are reported to kill more hunters than any other African animal – sometimes even ambushing hunters that have wounded them in the past. Available in the following sizes (Rectangle A): 10x8, 14x11, 20x16, 24x20, 30x24, 40x30. African elephants are intelligent animals, but also somewhat unpredictable. I've heard of big males charging Land Cruisers. And when I saw this guy swinging his trunk around and acting tough, I was hoping we'd be in for a false charge. I'm sure it would have been terrifying, but I can't imagine I wouldn't have gotten some interesting photos out of it. Unfortunately (or, perhaps, fortunately? ), no such thing happened. I think this guy was just showing off or something. Available in the following sizes (Rectangle B): 12x8, 18x12, 24x16, 30x20, 36x24. The starlings in Colorado are pure black, and not particularly interesting to look at. 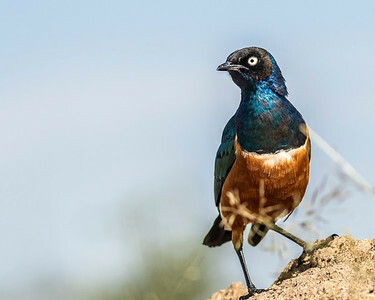 Tanzania's superb starlings, on the other hand, are simply stunning. Available in the following sizes (Rectangle A): 10x8, 14x11, 20x16, 24x20, 30x24. Most of the lions that I saw while on safari in Africa were in groups. 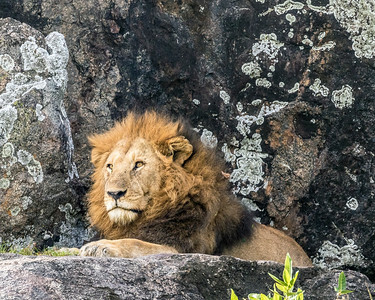 This guy, however, was on his own, perched high up on a solitary rock in the middle of the Serengeti. He almost appeared to be some kind of royalty, looking down on his kingdom from above. Available in the following sizes (Rectangle A): 10x8, 14x11, 20x16, 24x20, 30x24. 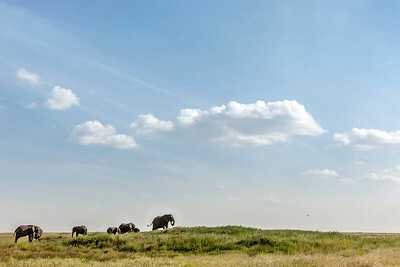 It takes a large, open savanna in order to make an African Elephant look small, but that's exactly what the wide-open plains of the Serengeti do. I saw elephants on their own, and in groups of what must have been 20 or more. This particular group consisted of only seven individuals. Available in the following sizes (Rectangle B): 12x8, 18x12, 24x16, 30x20, 36x24. 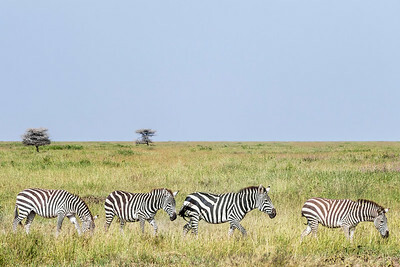 Although I took several photos of larger groups of zebras while in Tanzania, I liked the simplicity of this picture of four zebras in a single-file line. Available in the following sizes (Rectangle B): 12x8, 18x12, 24x16, 30x20, 36x24, 45x30.